There is no doubt that I prefer the sole trader to the chain. While I am a strong supporter of the much improved stores of the high street, there is a price to pay for the efficiency and economy of the offerings of large chain stores. For one thing, it’s unlikely that you’ll find anything that isn’t designed to appeal to a broad range of chaps; certain shops valiantly seek to sell taste but generally speaking, they’ll sell what they know people will buy. Although this is a central aim of any trade enterprise, large or small, the smaller the trader, the more unusual the wares. The trouble with homogeny is that certain subtleties of manufacture are avoided; the tragedy of off-the-peg or ‘ready to wear’ is that it is often not ready to wear at all. The trousers are cut too long, the jacket too roomy. Adjustments are often needed to really attain the best value from the economic purchase. The problem is that only a few stores, none of which were known to any persons I spoke to, actually offered gloves in more of a range than the generic sizes of small, medium and large. My research on the topic led me to discover that many see the sizing of small, medium and large as an alternative to the sizing in inches (6 ½ , 7 etc), the Zavier Jouvin method devised in the 19th century, and not as a homogenisation of glove sizing. However, despite the fact that Dents gloves are made in good quality leather, in a variety of colours, when I wear them I look ridiculous. Having experimented with ladies gloves, I now know that the problem lies with the particular style of gloves available to men. Women’s gloves reflect the daintier appearance of the hands that wear them; they are too small for my hands as the fingers are far too short, restricting my hand movement, but the way the leather is finished on the fingers is far more elegant. There is a delicacy lacking on most of the glove models available to men; they seem not to be made for fingers but tree stumps. 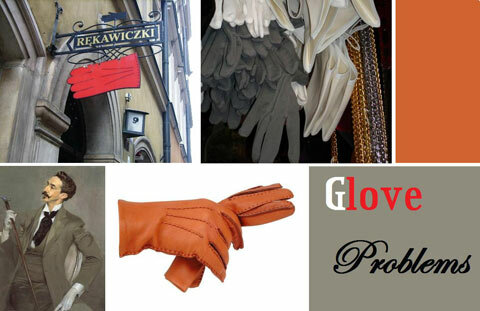 I discovered an interesting website, Gaspar Gloves which offered, from what I could see, more elegant dress gloves for gentlemen. Priced at $85, Gaspar are quite proud of their strong connection with Hollywood; on their home page, Angelina Jolie is pictured in fine leather period-style gloves, clutching a receiver in her latest film ‘Changeling.’ Gaspar is certainly the sort of trader I warm to but I dream of such availability in the real world, and not merely the virtual. I am unwilling to purchase gloves without first trying them on. I imagine walking into an independent glove shop just off Regent Street; a huge range of materials and colours, racks and racks of sizes on oak shelving, a crackling fire and a Sinatra soundtrack. “Formal black gloves for the evening, and would sir like some chestnut driving gloves for the country?” Sadly, such a shop remains a dream. I think I was born in the wrong century. Ah, the quest to obtain suitable gloves… A few years back I stumbled upon two pairs of Laimböck (since 1831) gloves in brown and black. I bought them instantly, for as you rightly observed, good gloves are hard to come by. The gloves are made of a supple leather, with durable finishing; meant to last. As a testimony to their quality: the usage they have endured hasn’t caused any visible distress. Laimböck stocks an overwhelming range of gloves, some of which are quite frankly hideous. Mine on the other hand are quite stylish, and could very well be the elegant dress gloves the author is looking for. Their website isn’t much use for locating shops (or browsing their inventory), but in my opinion one could do a whole lot worse than purchasing a couple of these gloves. I would suggest you engage the services of Chester Jefferies, as their gloves can either be hand made to well your hands, as well as their sizes being graduated to a much larger degree, additionally they have a large number of styles, leather types and colours and lining choices. Their webstore is now much easier to use, and the colours are quite close to the swatches shown. Additionally they are a very reasonable cost as well, around £40. T M Lewin have some quite presentable leathers in stock in London, no half-sizes but quite up to scratch, well at least for the average paw. I have always had trouble finding mens gloves that fit me properly. If you are willing to travel a bit – get our of London and make your way to Alwyn in Worcester. They will make up your size if they don’t have gloves in stock. They have a good variety, nice choice of linings and the prices are quite reasonable. Winston, I recommend Dunhill driving gloves. They are slim-fitting, a wonderful leather and seem to fit my hands well – and they have a similar sausage problem to your own. I’ve had mine in tan calf for about two years and they’ve worn well. Also, I recommend Bloomingdale’s if you are ever in the US. I have another pair from there was stocked in numbered sizes. They have a well-established reputation, and they offer a wide selection for men, very top drawer. If you desire, they also do custom work. As regards men’s gloves, I might also add, beside Dunhill that Simon has already recommended to you, (and I have to agree offer some of the best driving gloves available,) that you also look into A. Boon, Antwerp, and Hermes.